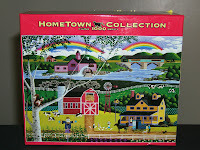 If you have read our other blog Emerging from Scratch you will know that we are really into puzzles right now. Figuratively and Literally. The kids have been working puzzles daily for the last two weeks and I got in on the bandwagon. I might have already mentioned starting a new summer tradition- working through a 1000 piece puzzle throughout the summer months. Well, I am not a puzzle whiz. It took me two different 1-2 hours sessions just to get the edge together. I picked a fairly easy puzzle because I didn't want to kill myself like the last time. When my husband and I were engaged I visited with him and his family over Christmas break. We decided we were going to put together a puzzle. We got a mountain scene reflected in a lake, that didn't last long let me tell you. Since then I had not wanted to repeat the misery of trying to put together a puzzle but seeing my children so happy I decided to take another shot at it. Our life right now seems like a puzzle except we don't have a box to look at to help us find where all the pieces fit. We have all these seemingly random pieces of experiences in our lives and cannot see clearly how they will fit together to make a picture. Our trust in God is being tested. God has the big picture view and He alone knows how the pieces of our lives will all come together for His glory. We have to be faithful and obedient to follow Him as He works in the individual pieces. I have to admit I have not been what you would call excited about what has been going on in our lives which feels at times like nothing. I am beginning to get out of myself and look around me to find God at work. He says "Be still and know that I am God". I am waiting for Him for I know His picture for my life is so much prettier and wonderful than I could ever imagine.